Dentifrices and mouthrinses are the major products for routinely administering effective cosmetic and therapeutic agents in the mouth. These products are the most widely used by consumers, generating the largest sales of all dental products. Besides attempting to prevent tooth decay, it is also becoming increasingly common for manufacturers to add therapeutic or preventive agents to reduce gum disease (gingivitis) and tartar (calculus) formation. A few toothpastes also contain desensitizing agents. Although the line between cosmetic and therapeutic actions is not easily drawn, most toothpaste currently on sale has similar objectives. They clean and polish the accessible surfaces of the teeth and provide a pleasant sensation and odor to the mouth. They also act as a vehicle for applying fluoride to tooth structure. These abrasive agents are the major constituents of toothpastes and may consist of silica, calcium carbonate, dicalcium phosphate, sodium metaphosphate, hydrated alumina, zirconium silicate, or calcium pyrophosphate. Most dentifrices will remove plaque without removing significant amount of tooth enamel. However, if a hard toothbrush is used with force, particularly on exposed root surface, abrasion can cause serious loss of dental tissue. These agents are used to give toothpaste texture, prevent drying out by retaining moisture and prevent hardening of the paste on exposure to air. Glycerol, sorbitol, and propylene glycol are commonly used. The purpose of these agents is to facilitate the distribution of the paste in the mouth by lowering the surface tension and helping to loosen plaque and other debris from the tooth surface. They also contribute to the foaming action of toothpastes. Fluorides work better in combination with detergents, which help the remineralization process of tooth enamel. The detergents commonly used are sodium lauryl sulphate and sodium N-lauryl sarcosinate. Alginates, gums or cellulose derivatives such as carboxymethyl cellulose and hydroxyethyl cellulose are used to thicken the paste, prevent separation of liquid and solid in storage, and to retain moisture, so the toothpaste will not dry out if the top is no replaced. One of its most important selling points is the taste of the toothpaste. In order to mask the less pleasant taste of some of the other ingredients, flavoring agents such as aromatic oils and menthol are added. The glycerol and sorbitol, used as humectants, sweeten the paste. In addition saccharin may also be used. These agents are available in many toothpastes for specific problems. In order to be effective it is important that these agents do not react with the other constituents of this paste. 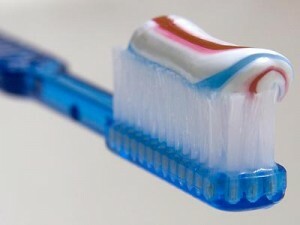 Fluorides – the most recognized toothpaste ingredient is probably the class of compounds known as fluorides. Fluoride incorporates itself into tooth enamel making teeth more resistant to acids produced by plaque bacteria, as well as acids found in certain foods. Fluoride sources provide 1000-15000ppm fluoride. 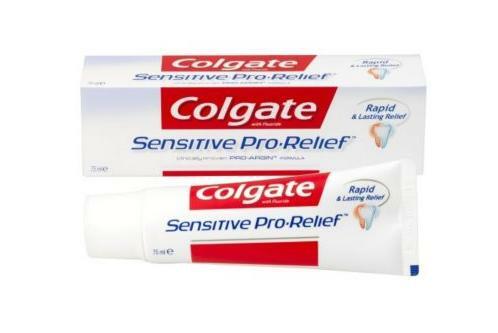 Desensitizing agents – toothpastes formulated to alleviate sensitivity of exposed dentine (for example Sensodyne) may contain one of the following agents: strontium chloride, strontium acetate, formaldehyde, potassium nitrate and chloride, or sodium chloride. Colgate uses calcium carbonate and arginine in its Sensitive Pro-Relief line. Anti-plaque agents – several toothpastes contain zinc chloride or triclosan, an antibacterial agent that is non-ionic (it has no charge). Unlike other proven cationic (positive-charged) plaque-inhibiting agents such as chlorhexidine, triclosan does not react with the detergents in the dentifrice. Because it is non-ionic its retention in the mouth is poor, but this has been enhanced by combining it with a copolymer or boosting its antibacterial activity with zinc citrate. 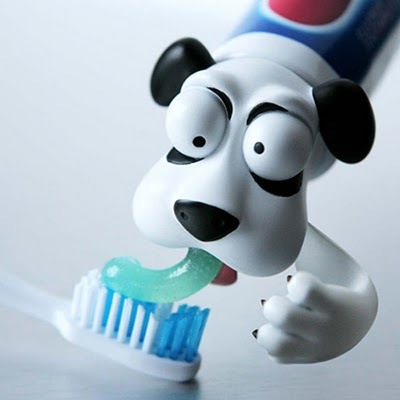 Such triclosan-containing toothpastes have been shown to reduce plaque formation and gingivitis to some extent. Anti-calculus (tartar) agents – several different agents have been added to reduce the formation of insoluble deposits called tartar. These include pyrophosphates, diphosphonates, and zinc salts. The agents work by removing calcium and magnesium from the saliva so that they cannot deposit on teeth. Xylitol – this sugar alcohol, which cannot be fermented by oral microorganisms, is added to some toothpaste. It sweetens the paste and it may have an anti-cavity action by enhancing remineralization and reducing the levels of microbes in the mouth. Alcohols, benzoates, formaldehyde and dichlorinated phenols are added to the toothpaste in order to prevent bacterial growth on the organic binders and humectants. These are added to make the product look attractive.